In the middle of the resorts, summer cottages, shopping areas and marinas that line Little Traverse Bay from Petoskey to Harbor Springs is Petoskey State Park. This 303-acre sanctuary may not be large but it’s amazing what it offers; some of the most secluded modern sites in the state, a beautiful beach, good hunting for Petoskey stones, and even a trail system. Originally of the W.W. Rice Company, the City of Petoskey purchased the land in 1934 and named it the Petoskey Bathing Beach. 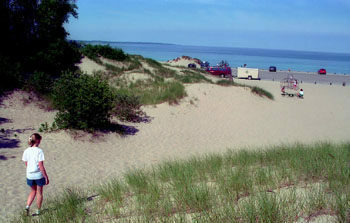 Eventually the city sold the beach to the State of Michigan and in July, 1979 the first campers arrived at Michigan’s newest state park. 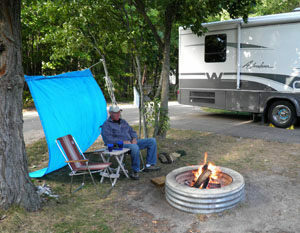 They’ve been arriving ever since as Petoskey’s State Park’s two campgrounds are among the most popular in the region. One of the most popular activities in the park is searching for Petoskey stones, the northern Michigan ritual of beachcombing and washing pebbles off in the Great Lake. Visitors stroll along the park's entire 1.25 miles of shoreline searching for the official state stone but many focus on the patches of pebbles and small rocks found at the south end. It takes a trained eye to spot the distinct coral pattern when the stone is dry, but they stand out in a handful of pebbles when held just under the clear surface of Little Traverse Bay. Away from the shoreline, the state park is a gently rolling to hilly area of old dunes covered mostly in deciduous forests along with small stands of conifers. Winding through the backside of the park is a limited trail system of 2.2 miles that includes Old Baldy Trail, a half-mile loop that climbs to the highest point in the park, passing an observation platform along the way. But the park is connected to the Little Traverse Wheelway, a 26-mile paved trail that connects Harbor Springs to Charlevoix. In the winter Petoskey State Park, with its abundance of lake-effect snow, is popular among cross country skiers and snowshoers. 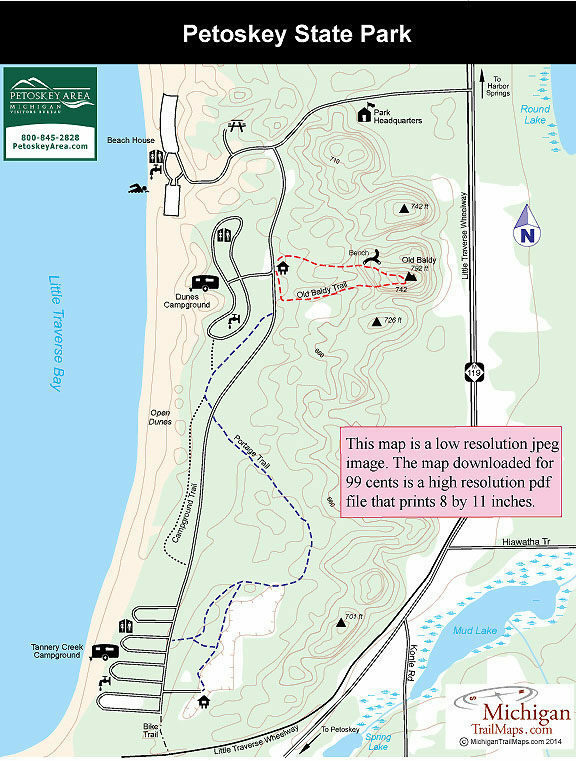 Contact Petoskey State Park (231-347-2311) for information on trail conditions. 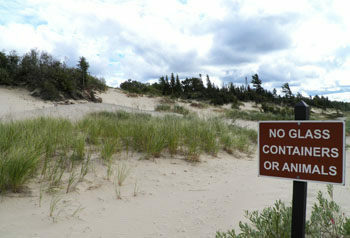 To reserve a campsite contact the Michigan State Park Central Reservations (800-447-2757; www.midnrreservations.com). For lodging or other travel information contact the Petoskey Area Visitors Bureau (231-348-2755, 800-845-2828; www.petoskeyarea.com). For more information or a map to the Little Traverse Wheelway contact the Top of Michigan Trails Council (231-348-8280; trailscouncil.org).